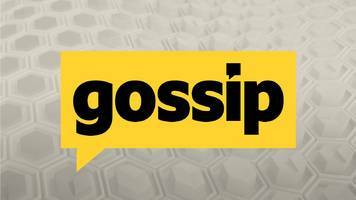 Scottish Gossip: Rangers, Celtic, Kilmarnock Aberdeen, Motherwell, St Johnstone. The Irishman is desperate for another strike option to go along with Odsonne Edouard. 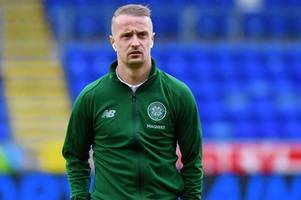 Leigh Griffiths is set to return to training with Celtic after taking time away from football due to mental health problems. 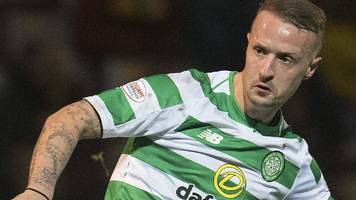 The Scotland striker stepped away from Celtic in December as then manager..
Celtic striker Leigh Griffiths will begin a “phased return” to the club this week. 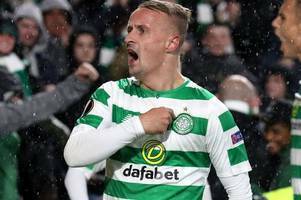 Griffiths, 28, has been out of action since December with personal issues, however, he will work at the club’s..
Leigh Griffiths will return to training with Celtic this week after being out of football since early December dealing with personal issues. 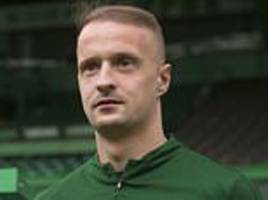 Leigh Griffiths will return to training with Celtic this week after being out of football since early December dealing with mental health issues. 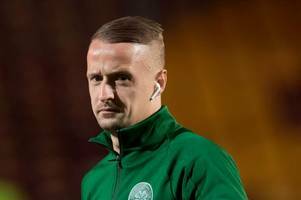 Griffiths was given time away from the club December to deal with personal issues and has thanked fans for their support. BBC Local News: Glasgow and West Scotland -- Celtic manager Neil Lennon hopes to have striker Leigh Griffiths back in the first team before the end of the season. Neil Lennon has revealed he met the striker this week and has given an encouraging update. Scotland boss Alex McLeish has handed Hibernian striker Marc McNulty his first international call-up. The forward, who joined Hibs on loan from Reading in January, joins Oli McBurnie, Oliver Burke and.. The interim boss has told the troubled striker he is desperate for him to return. The striker hasn't played since the start of December after taking time away from the game. 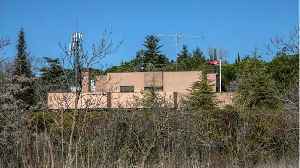 The footballer denies driving at 54mph in a 40mph zone on the A90 in Edinburgh in a Range Rover last January 21. Former Rangers skipper is praying Griffiths returns soon from his battle with off-field problems. 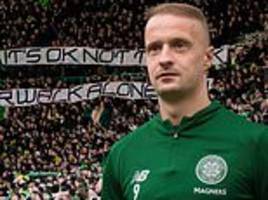 Since being granted a break from football to tackle mental-health issues, Leigh Griffiths has received supportive messages and backing from many rivals. Celtic striker Leigh Griffiths has said he will soon be back scoring goals and lifting trophies for the Bhoys. The Scotsman has spent a month out of the game to seek professional help and deal with.. The Hoops and Scotland striker said it is "not long" until he's back to playing and scoring for Celtic. The legendary Scottish broadcaster has battled with his own demons and made heartfelt plea. 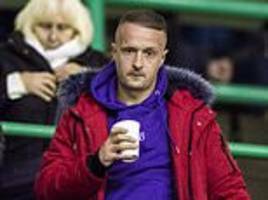 Leigh Griffiths has been reminded he is ‘not on holiday’ by Celtic manager Brendan Rodgers after the striker was pictured at Newcastle Racecourse during a period of indefinite leave. 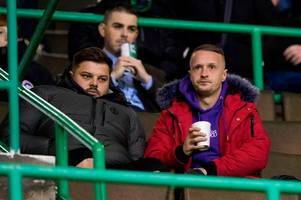 Griffiths, the..
STEPHEN MCGOWAN IN DUBAI: Brendan Rodgers reminded Leigh Griffiths on Wednesday night he is not on holiday after images emerged of the troubled striker attending a race meeting. 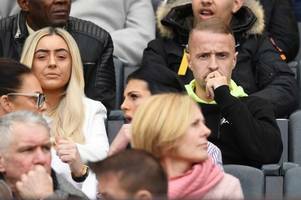 Rodgers has urged Griffiths to take responsibility for his recovery from off-field problems and stay out of the spotlight. 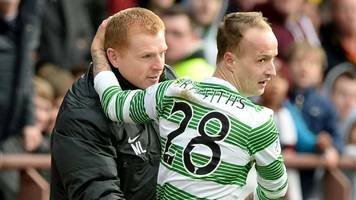 Keith Gillespie has knows he is one of football’s greatest warning stories and that's why respects Griffiths' candour so much. 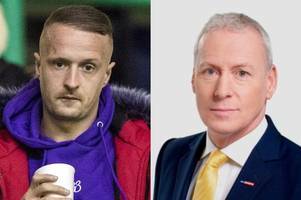 Former Wolves striker Leigh Griffiths says it is ‘laughable’ to suggest he is on leave because of problems with gambling or drugs. 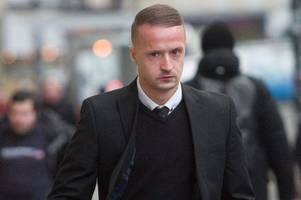 Leigh Griffiths has denied reports his absence from Celtic duty is due to gambling problem or drug addiction. 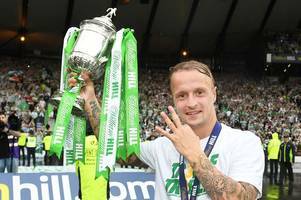 Last month the Scottish Premier League champions announced Griffiths would be taking time..
Leigh Griffiths has spoken out on his ongoing absence away from football, slamming reports which have accused him of struggling with gambling addiction and the use of drugs. 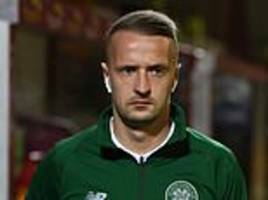 Celtic striker Leigh Griffiths says it is "laughable" to suggest he has been on leave because of gambling, insisting it is instead for mental health reasons. Taking to social media the Hoops striker said he wanted to settle the rumours "once and for all". 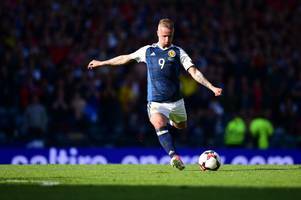 The Scotland international is currently taking a break from football but has provided an update on social media. 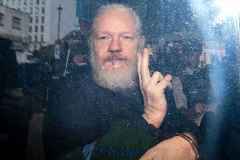 It's a funny old game and that has been as true this year as in any other - here's a rundown of the top bizarre moments. 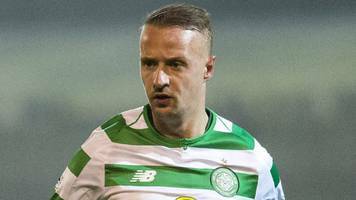 Griffiths is taking time away from playing to deal with off-field issues. Friends of Declan Gallacher launched a JustGiving page on Friday to help his grieving family pay for funeral costs and Leigh generously donated half the money sought just hours later. Celtic are considering a loan move for Bournemouth’s Jermain Defoe and West Ham United’s Andy Carroll, according to the Sunday Post. 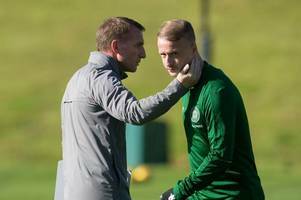 Brendan Rodgers and his side are aiming for a historic third..
Griffiths is taking a break from the game due to ongoing personal issues. West Lothian Courier sports reporter Callum Carson wishes Celtic and Scotland striker all the best and hopes he can get the support he needs to come back stronger. Gary admits he wishes he checked on some of his teammates more when he was a player. The Hoops star is taking a break from football due to personal issues and Rodgers knows he'll need to bring players in in January. 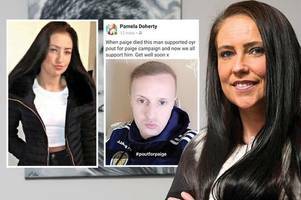 Pamela Doherty is the latest to show support for the Celtic striker since Hoops manager Brendan Rodgers confirmed he would be taking some time out from the game. Neil Lennon has assured Celtic striker Leigh Griffiths that he will feel better soon if he talks about his issues and follows professional advice after it emerged he is taking some time away from..
BBC Local News: Glasgow and West Scotland -- Neil Lennon says Leigh Griffiths will benefit from speaking about the mental issues that have led the Celtic striker to take time out of football. Hibs boss admitted to his own battles with depression and has told the 28-year-old he’s there for him. Is 6ft 2in ace the surprise man to step in for Rodgers with Celtic one injury away from crisis? Following the news that Leigh Griffiths is taking a brief rest from football, Celtic manager Brendan Rodgers in now just an Odsonne Edouard injury away from the club being in dire straits. The Hoops fans paid tribute to the No 9 by chanting his name and unveiling a banner. 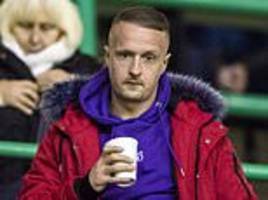 Leigh Griffiths has vowed to return a ‘better and stronger person’ after his indefinite break from football. 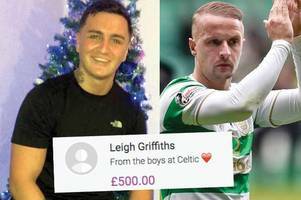 The Celtic striker also thanked well-wishers for their support after manager Brendan..
Celtic striker Leigh Griffiths has assured fans he is doing everything he can to return to football a 'better and stronger person'. Griffiths is to take time away from the game to deal with off-field..